This is one of my absolute favorite bracelets. The vibrant blues, greens & browns remind me of the ocean. 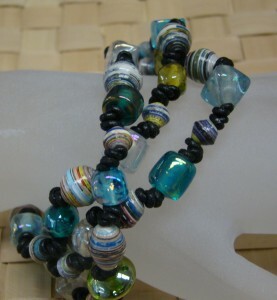 The bracelet consists of a mix of blue & green shades of India Glass beads, which gives this braclet it’s beautiful chunky look. 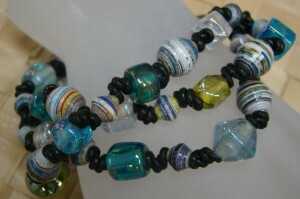 It is accompanied with bluish colored, Diamond-Shaped paper beads, adding a casual, earthy touch. 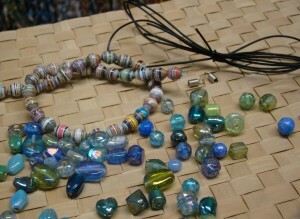 I stranded the differnt beads onto three differnt pieces of black wax cord and seperated each bead with three knots. I joined the three finished strands with a coiled connector on one side. I decided to braid them together to give the bracelet a more joined, clunky look and then ended it with another coiled connector. I was looking back at old posts, and I ran into this one. It is one of my favorites! I had no idea there were paper beads, but I love the idea behind the reusability of paper. Also? Just swinging by from SITS! Beautiful! 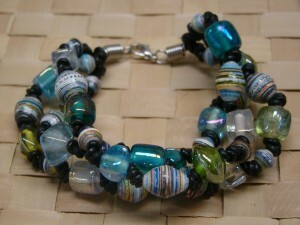 I’m wanting to start making bracelets again, but it’s hard finding the time with two little ones. Thanks for sharing! Oohhh, I really like this! After the new year I should get myself some beading materials!